The Advantages to buying an older dog are several. The first and most important is what you see is what you get. There is no guesswork - will this pup hunt, does this dog have a good temperament, is this dog gun shy, can I hunt with this dog? If not a hunting dog and primarily a pet the answers are no less important: will this dog get along with my other pets, does his dog like children, is this dog suitable for my home? Second advantage is the health of the dog. Outward issues like allergies and ear issues and skin conditions can be checked with a quick look-over. Other issues like eye CERF, heart clearnaces and hip x-rays often have been performed so you know exactly what you are getting. Third advantage, at least with any dog purchased from Just Ducky Kennel,is that you have a two-week trial period to make sure the dog is right for you and your home. And, at any time after that, if you find you can't keep the dog, he/she is always welcome back 'home'. You don't get to experience the joys of puppyhood and all that entails, including the housebreaking, chewing and having fun training your own puppy from scratch. 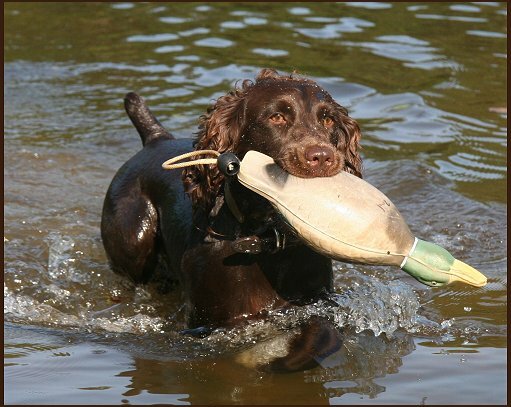 An older Boykin will bond with you and your family since they have that wonderful spaniel temperament and will adapt to their new home and all that pay attention to them with love and attention. Most of the dogs found here are either already neutered/spayed or will be sold without papers until proof of sterilazation is sent. Not all of the dogs offered here are "Just Ducky" dogs - some are here because their previous owner didn't have the space and time to wait for the right home and no Boykin belongs in a shelter. copyright 2014 - Web Designs by P.K.